GM to you too Yota. It is not due to definition of the word soon but it is due to their attitude. The can promise anything but then they can just simply ignore it and cancel it without giving any advance notice. Later on, if you ask them what had happened, they just say that God had created him to make mistake and for sure they would not make any apologize. Are they going to ink an agreement to use a common middlle east currency which had been planned old time ago? The possibility is very high. I was thinking the same. Hopefully RV before Ramadhan. Thanks Adam for the update. A few years ago i always dreaming for a very nice moments when iqd was rv’ed. But now, the feeling is still there but not as strong as before. Not to deal in dollars. 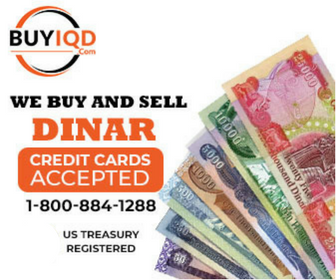 Deal in iraqi dinars instead. Financial management law is part of the government preparation towards monetary reform. The article is considerably very long. Thanks for your time spent to outline for all of us dinarians. Iraq adopts means its done.